These quality soft and warm stretch gloves are manufactured out of a balance of 90% Acrylic and 10% Spandex materials throughout. They are constructed very well. The wrist areas of the gloves have an elastic cuff sewn into the materials. These are GLOVES not mittens. They come in the following colors BLACK and RED. On the back or top of the hand there is a nice screen print of two hockey sticks and pucks in the shape of an (x), the finger tips also have the pucks on them. 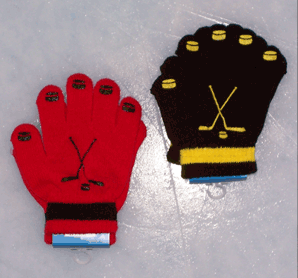 The screen print designs on the black gloves are in a bright yellow and on the red gloves it is black. They are designed to stretch and fit a child between the ages of (1 year old to 6 years old). They are machine washable and can be put into a dryer. They are very durable, do not shrink, and your child can grow with them. A quality item that is hard to find. Other Baby Skates accessories: Stretch Mittens, Hockey Set, Ty Beanie.